Passed away on 3.4.2019 after a long illness. Loving father of Annele and Michael. Grandfather of Jenna, Liam and Caleb. Brother of Noelle. Forever in our hearts. He will be sadly missed. Annele, Michael and family please accept our condolences on the loss of your dear dad Robert. With much love from Lauren and Don McLaughlin. 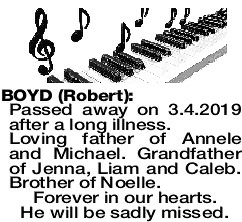 Our sympathy to the Boyd family on the passing of Robert. He was a kind, wise and good-natured, gentleman. We will remember him with fondness always. 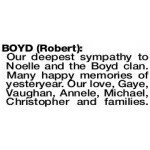 Our deepest sympathy to Noelle and the Boyd clan. Many happy memories of yesteryear. Our love, Gaye, Vaughan, Annele, Michael, Christopher and families. Our loving sympathy to Annele, Michael, Noelle and families. Memories and the music linger on. 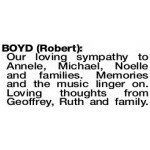 Loving thoughts from Geoffrey, Ruth and family.